We acknowledge that different organizations have different needs depending on their children’s age, comfort level, and other factors. Each of our Youth Team Building Programs is custom built around your needs to give participants the best opportunity to achieve what they need. Our programs can range from one-hour introductory activities to intensive week-long programs. We also work with many of our clients to develop multi-year curricula in which participants come back year after year for a new experience each time. We work with groups of virtually any size from 6 participants to well over 100. With many years of experience, our facilitators can accommodate the needs of nearly any participants. Groups on a tight schedule or a limited budget may wish to take advantage of our Half Day Programs. These programs typically begin with a brief introductory activity for the entire group before splitting into groups of 8-12 participants. Any single program (High Ropes, Low Challenge, or Tree Climbing) can run as a Half Day Program. It is also possible to run a combined Low Challenge / High Ropes Program as a Half Day Program, but this requires some concessions from each program. Full Day Youth Team Building Programs allow our facilitators to present participants with a variety of different challenges, while ensuring that there is a clear progression and connection from one challenge to the next. This creates a program in which each Low Challenge Element, High Ropes Element, or Tree Climbing Adventure is not just a one-off challenge, but a single step as part of a larger journey. In general, Full Day Programs begin with several large group activities before splitting into groups of 8-12 participants. We facilitate Multiple Day Programs for groups that require a deeper connection than a Full Day Program can provide. These programs often begin with a Half Day of large group activities before splitting into groups of 8 – 12 participants. Over the course of several days, one facilitator works with the same group on many different challenges. Assessments are provided on each day, allowing the group to track their progress and identify areas that require continued improvement. Groups will often come together over the course of the program to complete challenges that would be unattainable in smaller groups. In addition to providing the same benefits as our other programs, Multiple Day Programs tend to foster a greater sense of camaraderie and shared accomplishment between members of a group as they spend the majority of their time together overcoming challenging obstacles. Common Ground Adventures strives to provide unique experiences for your group, regardless of the number of times that we may have worked with them in the past. 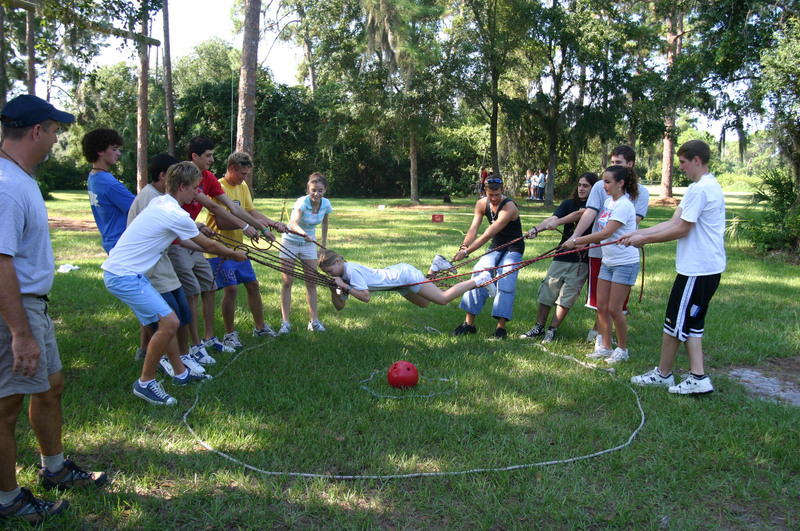 With this in mind, we create sequential programming for our clients to ensure that your group can explore new growth potential and aim to complete a different set of objectives during each yearly Youth Team Building Program. We commonly work with the same group of students year after year focusing on a progression through relevant skills for each age group. For example, a sixth grade group may focus on the skills required to work together as a new team in a fresh environment. The next year as seventh graders they may explore advanced collaborative problem solving. When returning as eighth graders they would have the opportunity to explore the importance of role modeling and mentorship. We also run sequential programming multiple times in the same year, such as an initial introductory session with an athletic team when they first begin training together followed by a more advanced morale-building session just before the team’s first game.